Help CentreUsing SuperControl Managing guests, emails and auto correspondenceCan I limit automatic emails for certain properties? 3. Click on the property names that should be enabled for this letter group. To select multiple properties hold Ctrl on your keyboard and click on each name (for Mac users use the Command key). Then click Add group. 4. Then select Add new letter > Go. 5. Select your letter eg. Arrival information then click Add letter. 6. Here you can set your criteria. This letter shows the schedule settings to send an arrival letter 7 days prior to arrival and only if the guest has paid their balance. 7. Once your criteria is set choose any attachments to include (these will only display if they are uploaded into SuperControl. For instructions to upload attachments click here). 10. To add additional emails to the same group repeat the process above. Prev: How can I schedule emails to be sent automatically e.g. balance reminder? 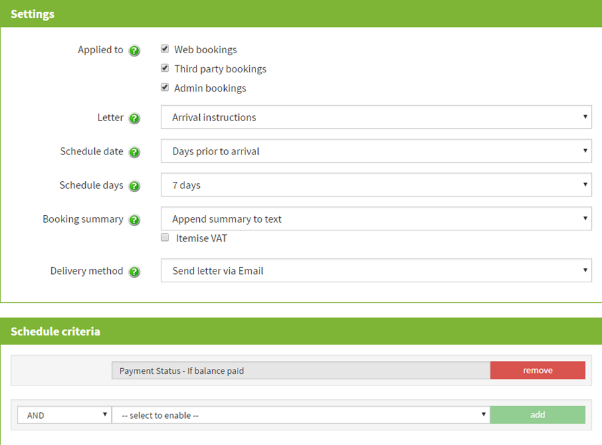 Next: Can I add automatic emails to pre-existing bookings?